A Game of Thrones: The Story Continues English, Mixed media product, Martin George R. R.
A Game of Thrones: The Story Continues by Martin George R. R. from Flipkart.com. Only Genuine Products. 30 Day Replacement Guarantee. Free Shipping. Cash On Delivery! 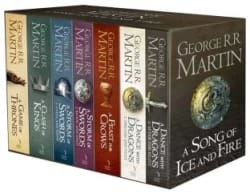 Price alert for A Game of Thrones: The Story Continues English, Mixed media product, Martin George R. R.